Dog lovers everywhere, rejoice! They really do love us on a chemical level. Dogs were found to make use of the “lovers’ hormone,” Oxytocin, to sneak their way into our hearts. That’s the first time the mechanism was observed between species. We know it as the love hormone: it spikes when we hug, kiss and make love. It also exists between a mother and infant, as they gaze into each others’ eyes. But oxytocin is more than that. The hormone is one of the most important evolutionary bonding mechanisms known to man. Without it, affection, trust and altruism, as we know them, would never have been possible. So imagine the surprise at Azabu University’s School of Veterinary Medicine in Sagamihara, Japan when Miho Nagasawa, Takefumi Kikusui and their colleagues found that the bond works both ways between our species: dogs just love to peer into our eyes, as we do into theirs. The mechanism is known to be a loop in humans. For instance, a mother’s gaze into a child’s eyes prompts the look of happiness in return. Both release oxytocin and reinforce it, feeding off of the feeling. Dogs are already renowned for their ability for companionship and understanding us in a way that no other animal can. But if the implications of the new findings are correct, they are huge, and will go toward explaining the age-old question of how dogs became our “best friends” thousands of years ago. "[Our] findings support the existence of an interspecies oxytocin-mediated positive loop facilitated and modulated by gazing," Nagasawa said in the study. She has three human-canine relationship studies that support her theory. Kikusui and Nagasawa invited 30 of their friends with pets to test the theory. First the team had each dog and owner interact separately with each other in a room for 30 minutes, recording them. The researchers then scanned for oxytocin levels in the urine in both species to see if they had changed. They immediately found that the more a dog gazes into a human’s eyes, the more pleasure and child-like feelings of adoration it experiences. That spike was mirrored in the owners. A previous study from 2009 corroborates this (scientists then found a strong basis for the new research when the effect of looking into a dog’s eyes was demonstrated in humans). To find out whether the feeling was mutual, the team sprayed either oxytocin or a simple saline into the noses of 27 of our furry friends and placed each dog in a room with its owner and two complete strangers. They found that the dogs sprayed with oxytocin spent significantly more time gazing into their owners’ eyes than the other ones, and that the effect was mysteriously absent in male dogs. Researchers speculate this could be because of increased sensitivity to the hormone. Further to this, the effect in the owners of the dogs was also increased, even though the owners did not receive the hormone artificially. 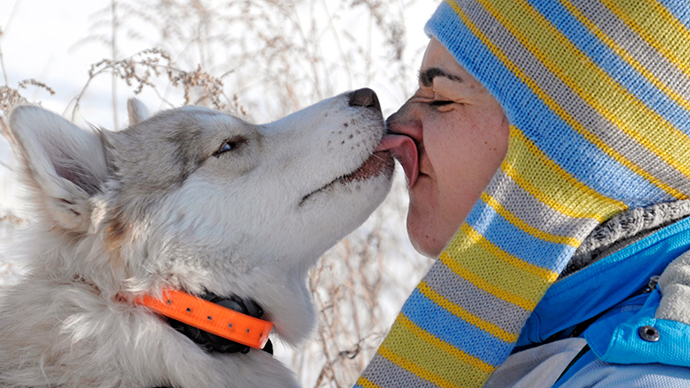 It follows that even an artificial oxytocin increase in the dogs signaled the release of the hormones in their owners. “It’s an incredible finding that suggests that dogs have hijacked the human bonding system,” Brian Hare, an expert on canine cognition at Duke University, North Carolina, who was not involved in the research, was quoted as saying in a Science article. “A finding of this magnitude will need to be replicated because it potentially has such far-reaching implications,” he said. It is also Hare’s view that oxytocin could be at the very core of why dogs are so useful in treating autism and people with post-traumatic stress disorder. No other inter-species oxytocin link has ever been observed, so the dog-human bond, for now, is a truly unique thing. It should also put a lot of sceptics at ease: dogs really do love us as deeply as we love them.